Dromos Records proudly announces the release of it’s first record, "Moments of Falling Petals", by Tetuzi Akiyama (acoustic guitar), Éden Carrasco (alto sax), and Leonel Kaplan (trumpet). The record documents a concert of the trio, recorded live at Sala Azucena Carmona, Real Teatro in Córdoba, Argentina. Informed by the vast spectrum of languages connected to the sphere of free improvisation and electroacoustic music, each of the musicians establishes a dialog with the other, creating, layer after layer,a plains of a rare evocative power, slowly sculpting the molecules of sound and space that propagate trough time until they reach a new and original form. Each cover is different and unique, and were all handmade and hand drawn by artist Joana Falhas. 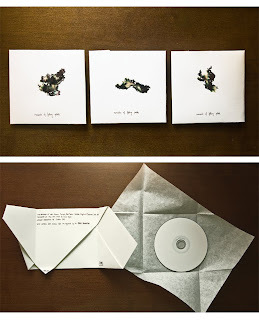 Cd-R comes in a limited edition of 250 copies.